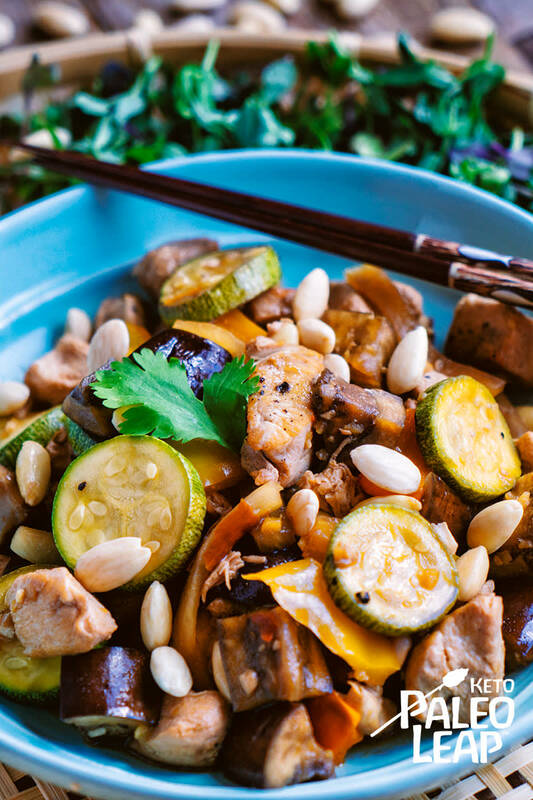 Kung Pao, or Kung Po, chicken may appear frequently on Chinese takeout menus, and you may even have a dark craving at the mere thought of biting into it, though if you want a low-carb, gluten-free version, you will have to get inventive in the kitchen. That’s what we do when we desire the flavors that we used to eat: we recreate a better, healthier version of a classic. Now, it doesn’t always turn out the same, often it takes trial and error, but this recipe is golden. You will know for a fact that you are eating Chinese food, and you can be certain that every ingredient in it is life-giving. In the past, variations of meat in Kung Pao included shrimp and frog legs, but we will stick with the traditional chicken breasts here for the sake of simplicity. One other thing that we will be skipping in our keto version, is the peanuts, or cashews, that were often roasted whole at the bottom of the pan before the other ingredients were added. And instead of making this a stir-fry, we are opting for the slow-cooker – we are really changing things up here! Yet, all the vegetables are here to savor, and the coconut aminos and fish sauce will make this taste amazing. If the thought of Chinese food makes your mouth water, why not serve an appetizer of Chinese chicken salad, skipping the cashews to keep it keto, while you wait? In a bowl combine the coconut aminos, water, fish sauce, garlic, ginger and chili flakes; season to taste and whisk well. Add the chicken, bell pepper, zucchini, eggplant and daikon to a slow cooker. Pour the sauce over the chicken and gently toss; top with the lemongrass. In a bowl combine the coconut flour with equal parts water and whisk until well emulsified. Pour the sauce from the slow cooker into a saucepan and bring to a boil. Add the coconut flour slurry to the saucepan and whisk until it thickens. Pour the sauce back into the slow cooker, toss everything and serve topped with fresh cilantro and almonds if desired.